Welcome to Ignite+ FAQs page. If you’ve got a question you’ll likely find the answers below. If not get in contact, we’d love to hear from you! The internet is a brilliant tool but sometimes we just end up tied in knots getting conflicting information and many of us end up reaching for the wine bottle out of exhaustion of it all! At Ignite+ we took the important decision to not sell our products online as we feel it’s so important to buy the correct product for your needs, not just your budget or taste. That’s why we come out and talk to you. Face to face as it should be for FREE. No pushy sales. Just useful, impartial advice and lots and lots of ideas and inspiration so you can start to make sense of what you’re actually wanting to do with your fireplace. We show you how your stove will look in your room using the very latest software and we’ll follow it up with a fully itemised and descriptive quote. We’ll invite you to our premises where in many cases, we can actually set up a room set to allow to visualise what we’re going to do for you. We work in the Harrogate, York, Wetherby, Leeds, Skipton and surrounding areas but if your outside of here, just give us a call and we’d be happy to arrange a survey. So now you have found us, you’re well on the way to sorting out that minefield that is purchasing and installing a stove. 2) We’ll come and see you at a suitable time and give you a full and competitive quote along with ideas and lots of information on the iPad. We’ll discuss designs and show you some ideas which we’ll base our quote on. 3) Your detailed and itemised quote is emailed (or posted, or both) within 24-48 hours. 4) If you like, we can invite you to our premises where you can view our stoves and if possible, we’ll source your preferred stoves to view. 5) If you confirm with us, you’ll have your stove fitted usually within 4 weeks by ourselves. 6) You pay when it’s done. 7) We come back to see you to make sure everything is all ok and explain operation and maintenance with you. along with a starter pack for your first fire. 8) You will be delighted to leave us with a 5 star feedback! What is different about Ignite+? We love design. Darren studied interior design for over 3 years so we’re able to discuss the overall design for your new centrepiece in more detail than any other company. We have countless images to show you and we never, ever underestimate customers expectations. Many of us like a little more help to help us visualise. After all, its a life purchase and it needs to look right. We do all the work ourselves. Accountability is so important to us us. We wouldn’t trust our company in anyone else’s hands. You deserve the best and that what you get with us. We always aim to be clean, tidy, punctual, flexible and attentive. We provide full instruction on how to use your new stove and we’ll even provide the wood and a log store if you like. We provide a 5 year labour warranty and of course, we’re fully HETAS registered for your piece-of-mind. We can also arrange annual sweeping of your flue and servicing of your stove. Keeping our costs under control is a key benefit for our customers. We keep our overheads as low as possible, work efficiently and we don’t waste time and materials. Every one of us at Ignite are utilised so it keeps our staff levels lower. This results in our prices being lower than our competitors. By not having a town centre showroom, this again saves us a huge amount of money on rent and staff costs. However, it’s important to be able to view products to ensure they’re suited to you. We’re able to invite you to our showroom for an exclusive visit when you want to visit us. Our showroom is located close to the A1 between Harrogate and York so we’re ideally placed too. We’re proud to showcase premium brands like Charnwood and Clearview along with the Hunter stoves group, Parkray, Henley and many others. We’ve put together a little “how to” guide to help you along with your new stove. All stoves work slightly differently. If you haven’t had an instructional visit and need some help, contact us and we’ll pop out and see you. Logs. Small split logs and larger logs for later. 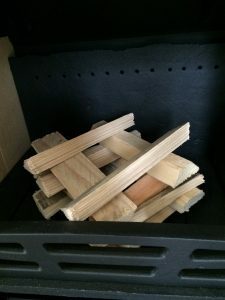 2) Build a tower of criss crossed kindling inside the base of the stove. 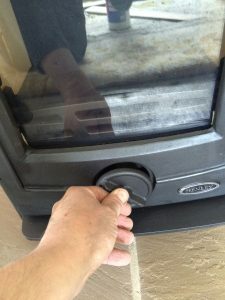 On woodburning stoves, you’ll place the kindling in the bottom of the stove. On multi fuel stoves, you’ll place the kindling on top of the grate (pictured.) Try to leave some ash in the stove from your previous fire as ash helps the wood burn more efficiently. 3) Ensure all the air vets are fully open on the stove. Some stoves have controls at the top and bottom, others have just one control. Ensure the control(s) are fully open as you light the stove to ensure we get maximum supply of air into the stove. It’s very important to get the stove as hot as possible, as quickly as possible. We do this by burning fast burning wood (kindling) and applying lots of air into the heart of the fire. I call it “pre-heating” the stove just like you would do with your oven. 4) Light the firefighter and carefully place inside the kindling tower. Add a few more sticks of kindling on top so the flames are in contact with the kindling. 5) Close the door but leave slightly ajar so the glass gets warm for a few mins. This avoids condensation build up on the glass and directs even more air into the fire to get it super hot. 6) After around 5 mins… open the door slowly to avoid any smoke entering room and add some more kindling to the fire. We want to try to get some nice hot glowing embers on the base of the stove before we add some logs. 7) Add some small split logs or larger pieces of kindling. After around 10 mins, close the primary control (usually the bottom control). If the fire dies down, open up for a little longer until your fire is really roaring. Build up the log size and when adding fuel, you may need to open the primary control to get the fire established. Add logs as the previous log burns down to approx 50% to prevent the fire from losing temperature. If you do add a log and the fire dies down, revert back to the above pre heating stage and open the vents fully to introduce extra air into the stove . The best practice is to place a log carefully at the back of the firebox on a bed of hot embers. Ensure the control is returned to normal position once the fuel has ignited and the fire has established. DO ensure you close the primary control when the stove is hot. Otherwise, you’ll burn your wood too fast and cause “over firing” to the stove. This will cause serious damage long term. DO make sure you use a reasonable amount of kindling to get the fire hot. A good handful should do it. DON’T rush it! Build up your wood size from kindling to small split logs. Putting a large log on straight after kindling will more than likely put the stove out. DON’T clean the grate out too often. Leave some ash on the grate or the base of the stove. It’ll help the wood burn better. DON’T ever store logs next to your stove. They WILL catch fire. DO ensure you purchase good quality dry logs. We can source them for you if you wish. How to light a stove. A brief You Tube video on how to light a stove. It’s important to keep in mind a few things to ensure your stove stays in tip top condition for years to come. How you look after your stove determines how it performs and how long it’ll last. Woodburning stoves: Clean out the stove as required but ensure you leave approximately 2.5cm (1″) deep in the base of the stove. Leaving ash will ensure the wood burns more efficiently. Multifuel Stoves: Ensure the ashpan isn’t too full. Empty roughly weekly when used daily. Glass can be kept clean using a baby wipe and dried with a dry cloth. Any stubborn marks can be removed by dipping the baby wipe in some ash and gently removing the stain off the glass. Dry with dry cloth or kitchen roll and chuck on the fire! Check door seals are intact and the door is firm to close. It’s important that air doesn’t leak between the door and stove when used. If the door seals become damaged or unattached, they just be glued back in place. Rope adhesive can be purchased on line or contact us for assistance. Check any moving parts (handle, door catch, controls) and give them a quick squirt with 3 in 1 oil or WD40. If any firebricks become cracked, don’t worry. This is completely normal and will not affect the operation or performance of the stove. If however they have disintegrated, it’s a sign of burning damp wood and they should be replaced in due course. The flue must be swept annually. Contact us for advise or contact our friends at Katie Sweep directly. When closing the stove down for the summer, clean the stove out completely and leave the controls fully open to ensure airflow into the chimney. This will prevent any moisture build up in the stove. Always tighten any loose screws/fixings. Things can work loose sometimes. Always replace door rope seal if it becomes loose or falls off. Never use the stove with the door open. And contact us if you need any help or advise. Part of what we stand for is being number 1 in customer service. Our reviews are testament for this. We’ve all heard horror stories of people who’ve had a kitchen or bathroom fitted or building work carried out by numerous different contractors only to end up with an expensive mess! The key word there is contractors. We don’t use them. We never will. That gives us accountability, consistency and transparency. It’s very easy to gain a bad reputation so we’re not taking any chances. That’s why we provide dust sheets, plastic sheets and rubber mats to protect wood flooring. We’ll advise during the survey the amount of disruption you can expect and discuss all elements of the installation so there will be no shocks or upsets during or after the installation. If required, we’ll arrange to sweep the chimney prior to installing the flue liner to reduce the risk of soot falls and we’ll take additional steps to ensure your room stays clean if the chimney appears to contain soot or debris. We guarantee you will not be disappointed but for your piece of mind, we’re also fully insured in the unlikely event of a worst case scenario. In order to get the best out of a stove, 3 factors needs to be considered. The stove MUST be suitable for purpose. Don’t waste your time with cheap imported stoves. (Under £400) They are invariably made from cheap recycled cast iron and made unethically to sell as many as possible to budget driven unsuspecting customers. Cast iron (and particularly cheaper recycled cast iron) is very brittle so these stoves need to be made very thick so they do not crack under extreme temperatures. This results in your lovely new stove taking up to 3 hours to warm up. Not ideal when you want to light it in an evening for a couple of hours after you get home from work! The other issue with very cheap stoves is build quality. Like anything, you get what you pay for. It’s important that you can regulate the temperature as it’s obviously colder in January than in April. Cheap stoves have much greater tolerances between handles, hinges and controls so you have very little control. The type, quality and condition of the wood will be critical to the output of the stove. A 5kw stove can easily achieve 7kw with good quality dry wood while it may not even achieve 2kw if the wood is wet or unseasoned. Seasoning of wood occurs when the tree is felled (usually in autumn) and left to season over the winter. The rain during winter washes the sap from the wood. Then in spring, the tree trunk is cut and split (logged) and then stored under ventilated cover for a minimum of 9 months. This then dries out the wood and then usually a moisture content of less than 20% is achieved. Moisture levels can be checked with a moisture meter which we can provide you with. Wood dries out at different rates depending on the wood. So 9 months may not be long enough. It’s important to buy wood from a reputable source. We can provide you with logs as part of our installation. Just Ask! 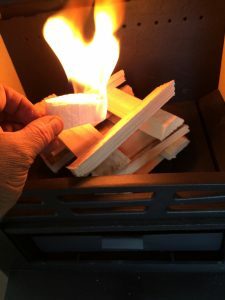 Starting a stove burning softwood (which is quicker growing and cheaper to buy) will get the stove hot quicker and once the stove is up to temperature, putting on hard wood (slower growing and more dense wood) will give you a longer burn at a higher temperature. Think of your new stove a little bit like an oven. You need to preheat the stove like an oven. This is done by kindling and quick burning wood. Then the stove can be regulated by reducing the air intake. Critically, avoid woods that are tantalised, pressure treated, painted and varnished and never attempt to burn MDF, chip board or other man made woods. The resins in the wood can seriously affect the life expectancy of your stove and flue. 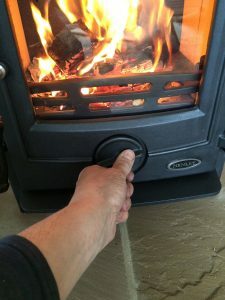 Whether you’ve inherited a stove in a house you’ve moved into, bought a stove and fitted it yourself or you’ve just not used a stove before, it’s so important to know how to use it correctly. Failure to use a stove correctly will not only affect the performance, longevity and heat output of the stove but can also be very dangerous. Not enough air going into the stove will not heat the stove hot enough and can result in creosote build up in the stove and flue. This can lead to a chimney fire. It will also make the glass go dirty. You can also get smoke entering the room if the flue is not hot enough. A chimney needs to be warm in order to drawer the smoke away. If you allow the chimney to cool, the smoke will more than likely drop down the chimney and enter the room. THIS IS EXTREMELY HARMFUL TO YOU AND YOUR FAMILY. Too much air going into the stove will burn wood very quickly. This will put a lot of strain on the stove. Imagine driving a car constantly at 100mph. It’s likely it won’t last too long. It’s important to ensure the stove is getting the correct supply of air to operate at a maximum efficiency. This will provide a clean glass, a warm room and a happy customer. It’s a small thing but every stove we fit, we follow it up by a visit to go through operation and maintenance. This sets you on the right track and ensures you enjoy your stove from day 1. It’s important to correctly maintain your stove too. We have a useful maintenance guide on the FAQ page. We also go through operation and maintenance as part of our after sales and we can provide you with an annual service and sweep from our local chimney sweep company, Katie Sweep. Can I not just fit the stove myself? There are websites out there saying just that but the reality is, would you fit your own gas boiler? Your own gas fire? Would you really put you family at risk for the sake of paying a few quid to a registered and accredited installation company? I do hope not! Yes, of course we charge to fit the stove and of course we’re going to advise you strongly not to even think about it but. However, a correct installation will give you complete peace of mind that the job has been done correctly, legally and safely. Of course, the other glaring issue with installing your own stove is the legal side. A) Have the stove fitted but ensure building control are aware and they must approve the work. B) have the stove fitted by a HETAS registered installer. HETAS regulations are generally far more stringent than building regulations. Many building control officers will not just advise you to find a HETAS installer as they charge to approve the work which may well not even meet regulations. Failure to provide correct sign off and registration can invalidate your house insurance in the event of a claim relating to the stove. Remember… It’s a fire in your house! You can confirm our registration here by visiting the HETAS website and finding us. What's a flue liner and do I need one? A flue liner is a flexible stainless steel tube. 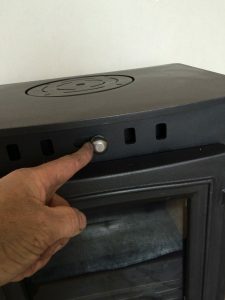 A flue liner for a gas fire is a single thickness and is uninsulated whereas a flue liner for a solid fuel or woodburning appliance has a secondary internal skin. 1) The purpose of a flue liner is primarily for safety. In masonry chimneys constructed from brick or stone, (pre 1960s) the mortar between the brick can degrade over years of use resulting in debris falling down the chimney onto your fire. This means that smoke can then leak freely through the bricks and escape into floor voids, roof spaces or even other chimneys including next doors in many cases. This is clearly a major issue and a flue liner must be installed in these cases. These issues are particularly bad in houses that have had an open fire as the smoke from coal fires can really degrade the inside of your chimney. However, there is a problem… It is very difficult to prove a chimney is leaking. Some companies light a smoke bomb at the bottom of the chimney and if the smoke comes out of 1 chimney pot, the assumption is made that the chimney doesn’t leak. This test proves nothing. The smoke may well be entering next doors bedroom and you be completely unaware if they are not in during the smoke test. 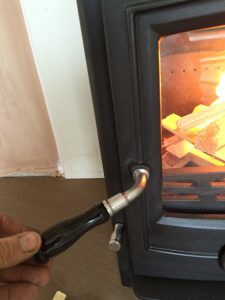 It’s a major contentious issue with old school stove installers but we simply cannot allow anybody to be exposed to inhaling smoke from a stove. 2) Flue liners increase efficiency. By installing a flue liner, you are reducing the diameter of the chimney. By doing this, the chimney drawers less air through the stove and consequently sends less heat up the chimney. Imagine a car. The faster you drive, the more fuel you use. By driving slower, you use less fuel and your car is far more energy efficient. A stove works just the same way. By installing a flue liner it burns the stove at the correct temperature, sends less heat up the chimney and you burn less fuel. As a consequence, less heat also means less smoke entering the atmosphere. 3) Flue liners are far easier to sweep and maintain. Without a flue liner, its very difficult to sweep the chimney. The chimney is a very big and the flue pipe from the stove is very small! Removing and refitting the stove every time the chimney is swept can get expensive. Many people have to have a hole knocked into the chimney with a door covering the hole. This is called a soot door. By burning at the correct temperature and drawing the correct amount of air, the stove will last longer as less pressure is put in the internal components. Going back to car, if you were to drive it like a maniac all the time you would not be surprised if the car enginedid not last too long. Burning a stove a the correct temperature will prolong the life expectancy the same as a car being driven sensibly. Are stoves safe around children and pets? Its obvious the woodburners and multi fuel stoves get VERY hot. Well we kind of expect that don’t we but how do we protect our loved ones? Educating our children is key to ensure they don’t get too close but its essential to protect them and the best way is a fireguard. Fireguards can be purchased in all shapes and sizes and many companies actually offer a made-to-measure service. Ebay is generally a good place to start or by contacting us, we can source a suitable fireguard for you. Fireguards don’t have to be cumbersome monstrosities nowadays. There some great designs and can actually be quite pleasing to the eye. ADVICE! Don’t buy one until your stove is fitted to ensure its sized correctly. In a word…No, stoves are not going to be banned. However, the industry as a whole has been under pressure for some years to reduce emissions on woodburning stoves and more so now since recent bad press particularly in London. The truth behind this bad press is mainly attributed to open fires and coal fires which are extremely inefficient and polluting. Nevertheless, in 2022, a new directive is being introduced throughout Europe and the UK called ECO design. This directive is centred around reducing pollutants and improving the efficiencies of woodburning and multi fuel stoves. So from 2022, it will be illegal for any stove company to sell a stove that is rated less than 80% which is brilliant news. What if my stove isn’t ECO design compliant? This is not an issue. The directive is to improve the emissions of future sales of stoves. If your stove is not ECO design ready, please don’t worry. No one will tell you you cannot use it! However, we’re very proud to work with stove manufactures such as Charnwood and Clock who have already produced models that are classified as ECO design ready. What’s the difference between ECO design and smoke controlled areas? These 2 things are very different. Areas designated as smoke controlled areas were introduced in the late 1950’s and these areas will not change. It is and will continue to be illegal to emit smoke in smoke controlled areas. Smoke controlled stoves always allow a small amount of air to be directed into the stove to ensure the smoke is burnt off inside the stove. Eco design stoves are all approved for smoke controlled areas and still produce a certain amount of smoke but due to the way the stove burns, the smoke produced is much cleaner than normal stoves. The waste gases on an ECO design stove are re-ignited before entering the flue so the smoke is significantly cleaner. Typically, an old stove around 10 years old will be around 60% less polluting than an open fire. A modern DEFRA stove is 80% less polluting than an open fire. An ECO design stove is typically 92% less polluting than an open fire. What is a smoke controlled area and how does it affect me? In 1958, smoke controlled areas were introduced to improve the quality of our air in the UK. Of course, since most of our industry has now departed our shores, it’s much less of an issue! Nevertheless, we’re under great pressure as a country to clean up our ‘act’ in accordance with European legislation. Most populated areas in the UK are classified as smoke controlled areas. Information from councils is somewhat inconsistent. Some councils have areas highlighted on their websites and some need calling to help you. We can help so contact us and we’ll find out for you. The exception to the rule is when the appliance has been exempt from this law. This means the stove is then approved for a smoke controlled area. At that point, it is permitted to burn wood and approved smokeless fuel on your appliance. See here to be directed to HETAS website for approved smokeless fuels. The stove is handed to DEFRA who tests the stove independently. They assess the emissions of the stove and if the stove burns to required standards, the stove is then approved. The manufacturer makes a small amendment to the stove prior to sending to DEFRA. They ensure that a small supply of air is always maintained even when the stove is turned down to its lowest level. This ensures the temperature inside the stove never drops too low and always ensures the smoke is combusted inside the stove as opposed to be sent up the chimney/flue and into the atmosphere. HOWEVER, it’s not simply a case of buying a DEFRA approved stove. It’s vital to burn good quality fuel. Burning poor quality, unseasoned, varnished, pressure treated or man-made wood (MDP, chipboard etc) WILL create smoke and this could result in complaints from locals. I don't have a chimney. Can I have a wood burning stove? Yes. Of course. How a chimney in an old house works can be replicated by installing a rigid twin wall flue system. The flue system comes in standard sized sections which are bolted together and braced to the wall of your house. There are very strict regulations on types of flue, distances to combustible materials and how the flue protrudes above your roofline which we’ll explain to you simply and by using images to demonstrate during the survey. However, just sticking a big silver flue to the side of your house or up through your roof is not how we do it. We look carefully at the options available to you during the survey and provide you with a truly bespoke solution. For instance, is your flue visible from your garden or your driveway? We can provide the flue in a far more visually pleasing black finish. (or even your chosen colour) to prevent your house looking like a chip shop! Powder coating is permanent treatment so will not flake off or discolour. Many companies take the easy option of running the flue outside and up the side of your house, we may look at running it internally if it’s feasible to do so. 2) The flue can work more reliably as the flue is not exposed to freezing cold temperatures and wind which can (in extreme weather conditions) affect the drawer and may even result in difficulty in operation or smoke entering the room through the stove. 3) Free heat!!! Yes, free heat in the room where the flue runs through. Whether it’s your bedroom or even a built in wardrobe. The flue will generate a little additional heat which can be quite effective. (The flue does need to be boxed in for safety which of course we’ll also take care of too) We deal with good quality European manufacturers to ensure the flue not only looks good but also works well from day 1 and for many years to come. How much does a stove cost to run compared to my central heating? There are many variables involved in answering this question. Placing the stove in a room where you think it could benefit more of the house is absolutely understandable but if this is a room where you generally don’t spend much time, are you really going to benefit? Try and think of a stove as a woodburning radiator. That can usually put them in context. Personally though I think they look a little better! Our advice is to ensure you place your stove in your main living area so you can utilise it as much as possible. This should mean you rely less on your central heating and more on your stove. Remember that wood burning and multi fuel stoves are designed as room heaters, not house heaters so if you have a larger house with many bedrooms where the kids hang out in an evening, you’ll still need your heating on. A good recommendation would be to ensure you have thermostatic radiator valve fitted so you can independently control your radiators. This means your living room will not be centrally heated but the rest of the house could be if this was of a benefit. That is not to say that in many cases, they can affect the bedroom (or room) above where the chimney runs and as the heat is very evenly spread, in many cases, downstairs living and dining areas. Of course it depends on the house and the layout. There are so many different sorts of stoves that are designed for different needs. Larger areas can benefit from convector stoves or multifuel stoves as they can run for longer. Talk to us. We can simplify this by discussing your needs. How much does it cost to run a stove? 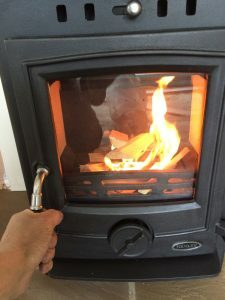 To answer this well asked question about how much it costs to run a stove, indicative costs for a cubic metre of seasoned wood costs around £70 for seasoned hard wood logs. 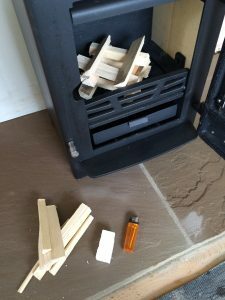 Ordinarily, on normal use for a 5kw stove which would heat an average sized 4m x 4m living room, we would anticipate 1 – 1 1/2 loads of wood per winter. For installation prices, click here! Well let’s go back to picking the stove. Looking for a stove?? We take a lot of things into consideration when we look for a stove for you and more importantly than anything else it’s the output. Yes we want a big window so we can see the flames but if the stove is too hot, it’ll make the room very uncomfortable. Then if we turn the stove down, the window will go dirty. However, there are a range of stoves on the market called slimline stoves. They give you a larger viewing area without being too hot. Remember, what stove we fit for you reflects directly on us and the advice we provide. It’s in our interests to ensure you end up with exactly the right stove for your needs, budget, lifestyle and home. Can my stove power my central heating? The simple is answer is yes. Many stove manufacturers produce boiler versions of their stoves which can theoretically be connected to your home central heating system. The boiler must pay for itself otherwise what’s the point? It’s important to look at the big picture. Cost of the stove, installation, plumbing work, upheaval, mess and decorating. Also, a boiler stove uses a lot more fuel than a normal room heating stove. If you were to buy a 5kw stove to heat your room, the probability is that a boiler stove would need to be almost double that at around 9kw as much of the energy produced from the stove is sent into the central heating system. That means you’ll be buying almost double the amount of fuel. Boiler stoves really need to be used for very long periods of time and this means that you’ll more than likely need to burn solid fuel. Solid fuel burns for much longer periods so would enable overnight burning whereas wood is unlikely to burn overnight so when you get up in the morning, the stove will have gone out. Solid fuel is quite expensive to buy versus wood and it’s quite dirty to handle. A boiler stove may not be suitable to link to your existing heating system. Many of us now have a modern combination condensing boiler. These boilers heat the water on demand when we turn on the hot water tap. This is called a pressurised system. It’s difficult and expensive to connect a stove to this sort of system. A stove boiler essentially passes cool water into the stove and the fire heats up the water and sends it out of the stove into the central heating system. It’s that basic! However, the water must be stored somewhere until it’s required and a pressurised central heating system does not have a water storage facility. (Cylinder tank.) a pressurised thermal store could be added but is serious money and takes up quite a bit of room. A standard central heating system is not pressurised. The boiler (gas or solid fuel) heats up the water and stores it in a cylinder tank usually in a airing cupboard. The water is stored in the cylinder until its used. This system is relatively easy to connect to a stove via a sort of junction box called a centraliser. You need some sort of central heating. It may as well allow woodburning as an option. We would recommend not restricting yourself to woodburning / solid fuel alone. A popular route is electric or gas under floor heating with a standard multifuel boiler on a separate system. The 2 systems do complement with other in our experience. Consider a thermal solar panel connected to your system as this can heat your hot water in the summer when you’re not using your stove. Despite oil dropping in price recently, it’s still very expensive to best your home and you do rely on deliveries and a large oil storage facility. Even though it’s expensive to have a boiler stove fitted, it’s likely to still pay for itself even in the medium term over using oil.